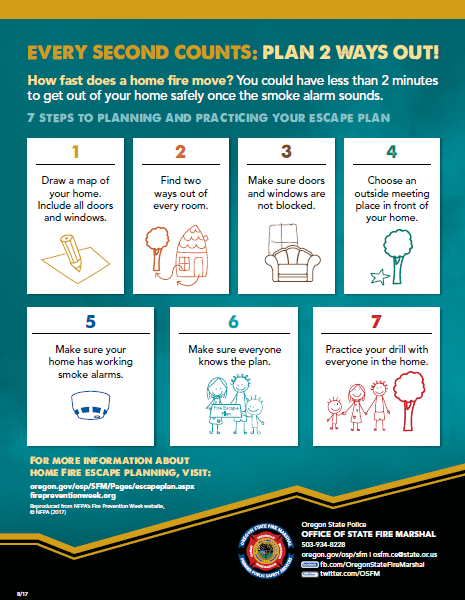 Stayton Fire District - Fire Safety Message - Every Second Counts! Stayton Fire District - Fire Safety Message - Every Second Counts! Fire Safety Message - Every Second Counts! When a fire occurs in the home, in many cases there may only be as little as 2 minutes after the alarm has sounded to safely exit your home. These valuable seconds go by fast during an emergency so its important to plan your escape routes and have a meeting place. Another small prevention tip is to make sure that you are never blocking exits with furniture, clothing or other obstructions. If you have items you cannot move away from exits, be sure to discuss this with your family so no one wastes valuable time trying to exit!